One of the first things I do with a new install of Visual Studio(VS) is I head over to DevExpress and download/install CodeRush Xpress. CodeRush Xpress is a free refactoring tool from DevExpress for VS 2010 or older(They stopped offering the free version for VS 2012 or newer so now it looks like the first thing I'll be doing with a new install of Visual Studio is beg my boss for a CodeRush license). If you are not familiar with refactoring and you are interested in being a better coder you should read Martin Fowler's book: Refactoring: Improving the Design of Existing Code (Addison-Wesley Object Technology Series). In it the authors Martin Fowler, Kent Beck, John Brant, William Opdyke and Don Roberts give very practical advice on improving the design of code. Along with improving the design of code, refactoring can improve the readability of code. 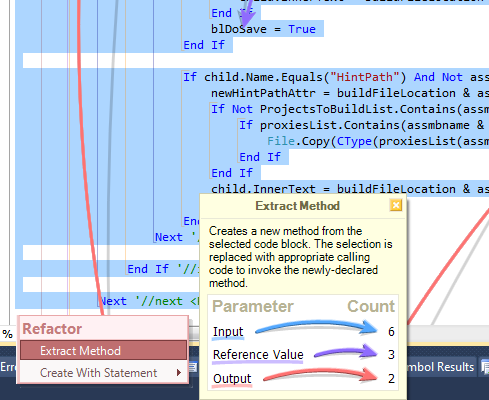 My favorite refactoring pattern for this is Extract Method(EM). When you come across a really long method or find that in a moment of coding frenzie you have created one yourself, it's time to do some EM'ing to make things more readable for the next person that has to look at your code(which may be yourself in which case you will hear the thanks first hand from yourself). 'So we take out the project reference. xmlHintPath.InnerText = buildFileLocation & CType(htProjGuidAssmb(projGUID), String) & ".dll"
xmlHintPath.InnerText = assmbname & ".dll"
newHintPathAttr = buildFileLocation & assmbname & ".dll"
child.InnerText = buildFileLocation & assmbname & ".dll"
According to Visual Studio Code Metrics the Maintainability Index of UpdateHintPath is 16. This is not good. The first thing you should do before undertaking any refactoring is make sure the code is covered by some automated unit test. If it isn't then you should apply one or more of the techniques outlined in Michael Feathers awesome book Working Effectively with Legacy Code. Once the code to be refactored is under test and all tests are green then we can proceed. 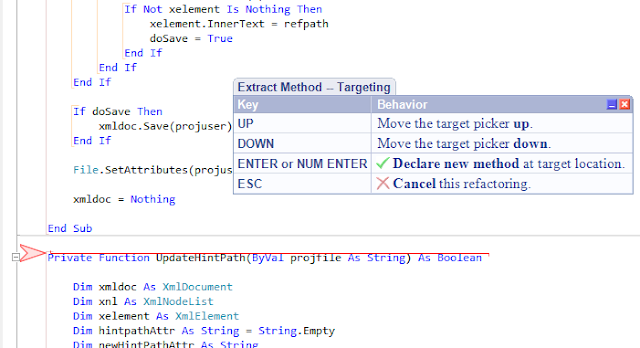 Then make sure Extract Method is selected and press Enter. Next use the Up and Down arrows to move the red line to where you want the new method code to be put and hit Enter. CodeRush takes a guess at the extracted method name based on a nearby comment which can be bang on sometimes and all you would do is hit Enter and be done, but in this case I would like to change it to something that better describes what the new method is doing UpdateHintPathForDotNetTwo. After changing the name and hitting Enter the new method creation is completed and you will notice that Coderush also took a best guess as to what needs to be passed into the new method, more on this later. To get back to the original method all that needs to be done is press the Esc key. And there we can see our new method call we just created. Then I repeated the process for the Else statement and called it UpdateHintPathForDotNetOne. Visual Studio Code Metrics is now reporting that the Maintainability Index of the new UpdateHintPath is at a respectable 50. Finally remember to run the unit tests to make sure they are still all green.